TEDxBozeman brings new perspectives, fresh concepts, engaging stories, and world-changing ideas from Montana to the world. The event debuted as the first TEDx event in Montana in 2012, and has since grown into an internationally-recognized platform. Each year, the TEDxBozeman team tests the limits of what's possible - challenging ourselves to organize an ever more impactful event for Southwest Montana and beyond. Our efforts are not going unnoticed. 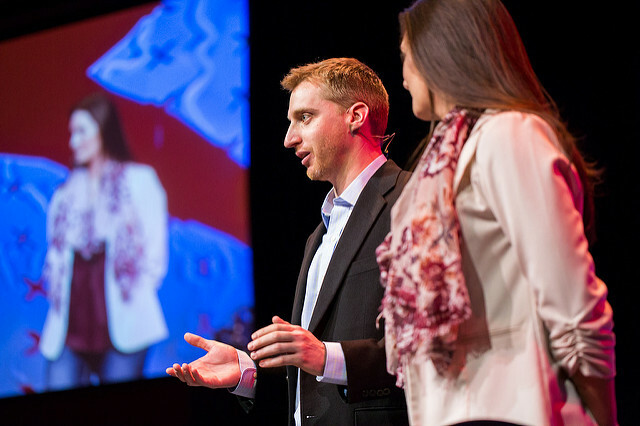 In 2014, TEDxBozeman was featured on the front page of the TEDx.com and you might have also seen us in WIRED Magazine. New perspectives from the last best place. These are ideas worth spreading. Co-founder, Ken Fichtler, and longtime Event Director, Brooke Leugers, open the event. Native American dancer, hip hop artist, flutist, and comedian, Supaman, on stage. Sasha Joseph Nuelinger shares his personal journey to overcome child sexual abuse. In the spirit of ideas worth spreading, TED has created a program called TEDx. TEDx is a program of local, self-organized events that bring people together to share a TED-like experience. Our event is called TEDxBozeman, where x = independently organized TED event. At our TEDxBozeman event, TED Talks video and live speakers will combine to spark deep discussion and connection in a small group. The TED Conference provides general guidance for the TEDx program, but individual TEDx events, including ours, are self-organized.